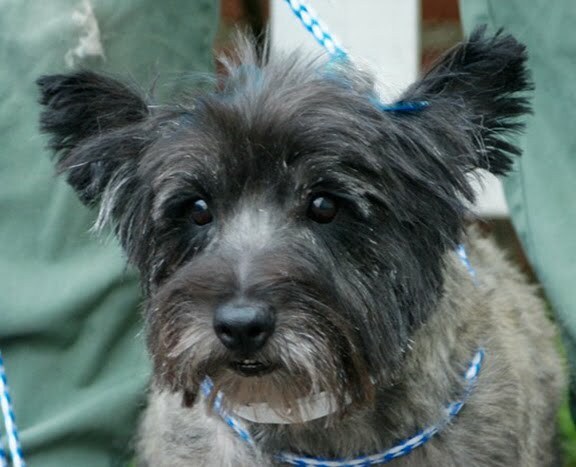 Mary Skavinski adopted Keith, one of six Cairn Terriers that the CTCSC rescued in September, affectionately known as the 6-pack. She had him barely two weeks when the unthinkable happened: He broke out of his collar and ran away. Losing a dog is a traumatic experience any time. But when that dog has already been through a great deal of torment, and is new to its forever home neighborhood, it is especially upsetting. What to do? Here is what Mary did, tips for anyone who suddenly finds themselves in such a desperate situation. "Karen Smith, who facilitated Keith's rescue, gave me lots of search suggestions. I did the traditional of posters, with picture, on posts, posters given to vets, pet stores and groomers, ad in local paper and walking neighborhoods talking to residents. Home Again (http://public.homeagain.com/) sells microchip implants and a tracking service. They will keep a description of the dog and a picture on file. If dog is lost and they are contacted they will e-mail a poster that can be reproduced. They also send, online, the poster to their networking clients (I am one) that live in the area so members can also be looking. There is a yearly fee for this service. kijiji (http://www.kijiji.com/) is a free online ad service, located on eBay. They are based in Canada but they have local listings, tied to your Zip code. The lady that found Keith found my ad that I had placed on kijiji. Local your listings and then find the lost pets section. Pet Amber Alert (http://www.petamberalert.com/) is a fee service. The fee runs $30 to $130 depending on the area of coverage desired. They do the contacting (vets, groomers, police, shelters, etc) with posters and have networking.